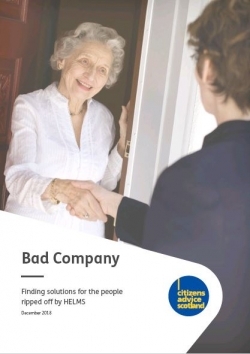 Our Citizens Advice Bureaux have reported a variety of issues relating to HELMS including: pressure selling, misleading information, unexpected costs, the vulnerability of some customers, mis-representation, installation issues, the transfer of the Feed-in Tariff and multiple financial tools, failure to get Building Warrants and appropriate permission from homeowners, long contracts and issues with redress. In some of the most serious cases people mis-sold the Green Deal by HELMS report having lost their life savings, others are unable to sell or insure their homes. Alongside the financial implications, our local impact report highlights the stress and anxiety that this situation has caused for the people affected. Instruct an independent body to contact all HELMS customers to inform them of potential issues and to provide guidance to consumers who feel like they have been affected on how to complain. Independently review all complaints to determine just how widespread the practice of mis-selling was. If this review confirms widespread breaches of the rules of the scheme, then we call on the UK Government to set up a dedicated redress scheme for HELMS customers to fast track complaints and provide satisfactory compensation for those affected. We also believe a solution is required for consumers who were mis-sold Feed- in Tariffs so any lost payments are refunded and affected householders are the registered beneficiaries for future payments. Finally, we request bespoke solutions for specific issues, including a fund to repair faulty goods and a means to provide Building Warrants for those who require them.